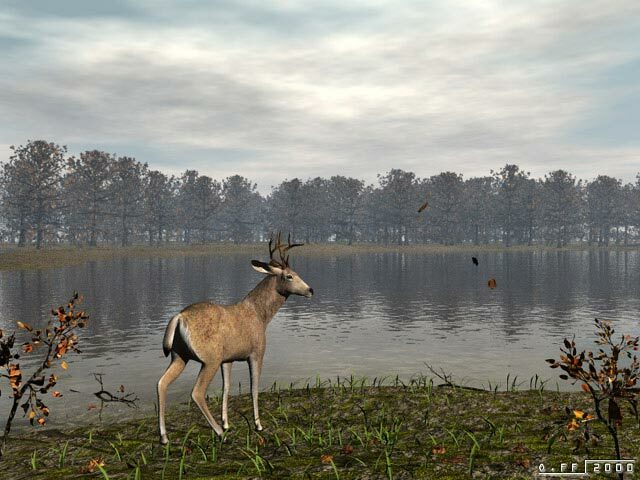 This one started as 'autumn in Sologne' (a marshy region in central France), but I later changed my plans and the continent it is set in as I could not find a brocket deer model. I could not get the water transparency near the shore correctly with Bryce. So I rendered the scene in two passes: one with the water and one without. I composited both of them in Photoshop. The small trees are made with Plant Studio. 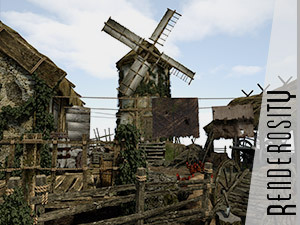 Medieval buildings from Dante78 at Renderosity. No specific products were used for this picture, apart from the DAZ buck.